CUPERTINO, California―November 30, 2012―Apple® today announced the Wi-Fi versions of iPad® mini and fourth generation iPad with Retina™ display will be available in China on Friday, December 7, and iPhone® 5 will be available on Friday, December 14. iPad mini and the new fourth generation iPad with Retina display are currently available in 42 countries, and iPhone 5 is available in 47 countries, including the US, Australia, Canada, France, Germany, Japan and the UK. iPad mini is a completely new iPad design that is 23 percent thinner and 53 percent lighter than the third generation iPad, and features a stunning 7.9-inch Multi-Touch™ display, FaceTime® HD and 5 megapixel iSight® cameras, ultrafast wireless performance* and an incredible 10 hours of battery life. ** The fourth generation iPad features a gorgeous 9.7-inch Retina display, new Apple-designed A6X chip, FaceTime HD camera and ultrafast wireless performance*. Both iPad mini and the new fourth generation iPad come with iOS 6.
iPhone 5 is the thinnest and lightest iPhone ever, completely redesigned to feature a stunning new 4-inch Retina display; an Apple-designed A6 chip for blazing fast performance; and ultrafast wireless*—all while delivering even better battery life. ** iPhone 5 comes with iOS 6, the world’s most advanced mobile operating system with over 200 new features including: Shared Photo Streams, all-new Maps app, Passbook® organization and even more Siri® features and languages. iPad mini with Wi-Fi models come in black & slate or white & silver for a suggested retail price of $329 (US) for the 16GB model, $429 (US) for the 32GB model and $529 (US) for the 64GB model. The fourth generation iPad with Wi-Fi models come in black or white for a suggested retail price of $499 (US) for the 16GB model, $599 (US) for the 32GB model and $699 (US) for the 64GB model. 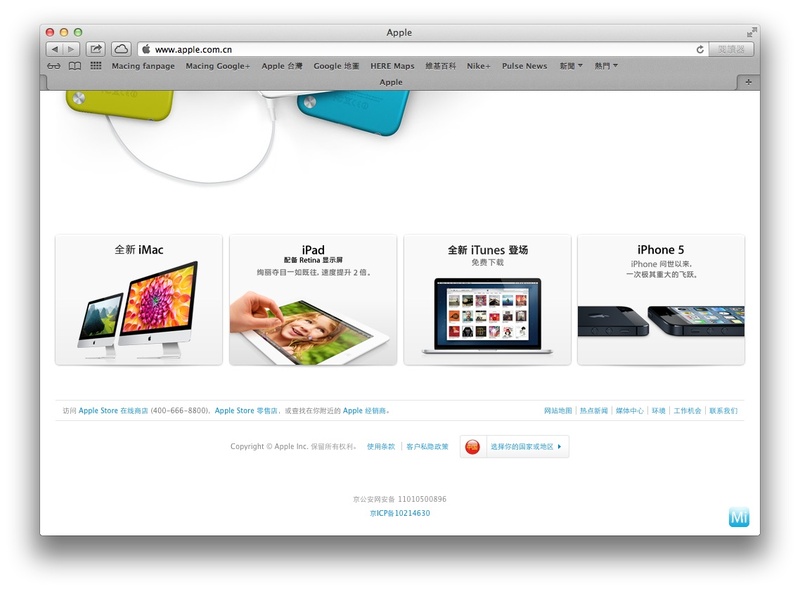 In China, iPad mini and the fourth generation iPad will be available through the Apple Online Store (www.apple.com), select Apple Authorized Resellers and by reservation from Apple retail stores. Reservation requests will be accepted daily from 9 a.m. to 5 p.m. beginning Thursday, December 6 for pick up the following day. Additionally, iPad 2 will be available at just $399 (US). iPhone 5 comes in either black & slate or white & silver for a suggested retail price of $199 (US) for the 16GB model, $299 (US) for the 32GB model and $399 (US) for the 64GB model. In China, iPhone 5 will be available through the Apple Online Store (www.apple.com), select Apple Authorized Resellers and by reservation from Apple retail stores. Reservation requests will be accepted daily from 9 a.m. to 5 p.m. for pick up the following day. iPhone 4S is available for just $99 (US) and iPhone 4 is available for free with a two-year contract from participating carriers. Apple, the Apple logo, Mac, Mac OS, Macintosh, iPad, Retina, iPhone, Multi-Touch, FaceTime, iSight, Passbook and Siri are trademarks of Apple. Other company and product names may be trademarks of their respective owners.